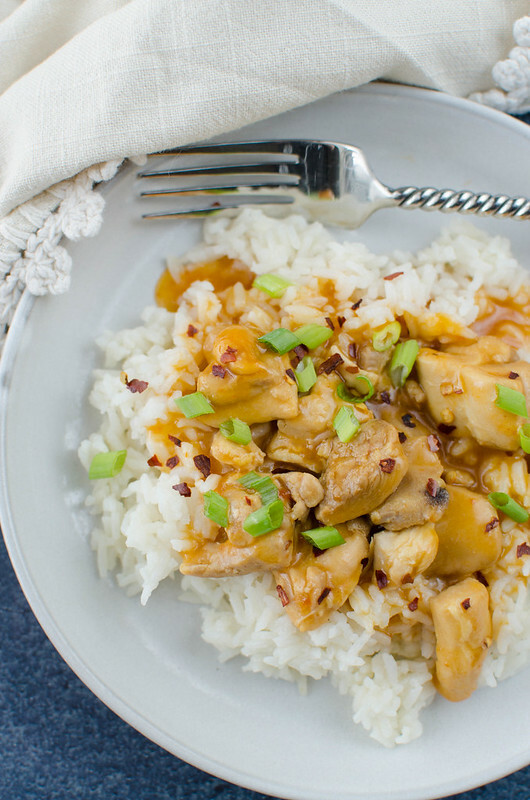 Pressure Cooker Orange Chicken – takeout taste in 15 minutes! 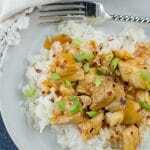 Chicken thighs are cooked in a sweet and spicy orange sauce and served over rice for a kid-friendly, weeknight meal! It has been raining nonstop. I feel like I’m back home because we get afternoon showers most days of the week. And then it got cold for a while. It’s been a weird couple weeks in central Texas. The weather’s got me craving major comfort food without a lot of work. This is the Crock-Pot Express Crock Multi-Cooker. And I’m obsessed with it. So it combines the functions of pressure cooker, slow cooker, steamer, sauté/browning, and it has 8 preset buttons that cook a variety of meals. Like, it has a button that perfectly cooked beans and one for soup and one for poultry. All that. I’ve had it for probably a month and I’ve used almost every day since then. My kiddos have practices 4 days a week right now and they tend to run pretty late, so I’ll chop whatever needs to be chopped for dinner ahead of time. And then all that I have to do is pop it all in the Crock-Pot Express Crock Multi-Cooker when we get home and then I can walk away for a few minutes and help with homework or whatever and then dinner’s done in 15 minutes. 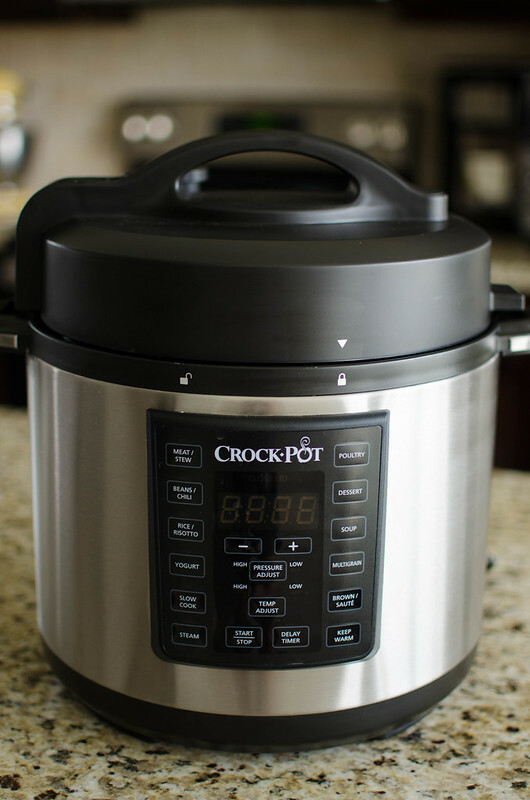 Dinner comes together 70% faster with the Crock-Pot Express Crock Multi-Cooker! The Crock-Pot Express Crock Multi-Cooker is also available in 4-Quart and 8-Quart models, so it can accommodate any family size! 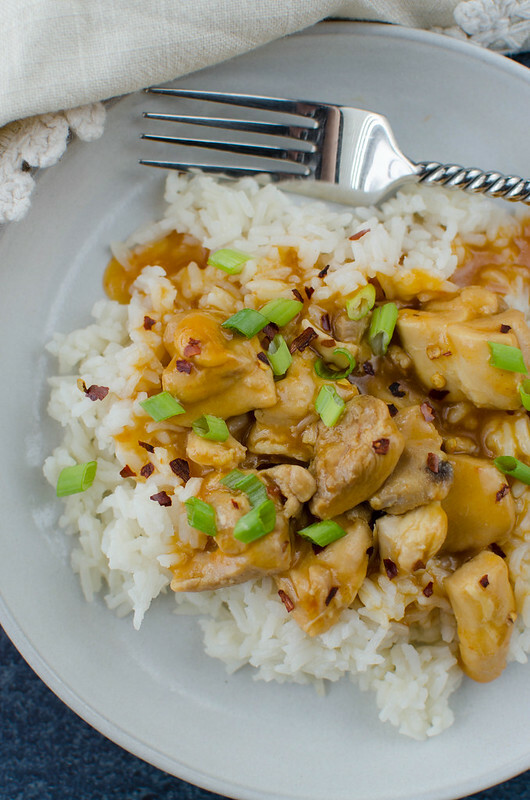 This orange chicken couldn’t be easier. Everything just gets tossed into the Crock-Pot Express Crock Multi-Cooker and you hit the “Poultry” button and the “Start” button and that’s it! The poultry setting is 15 minutes and it does take a few minutes to come to pressure but it’s all hands-off time so it’s seriously the easiest dinner. And the rice just blows my mind because I can’t cook rice on the stove to save my life. It ends up mushy and goopy and terrible. Like, I buy precooked rice. It’s that bad. 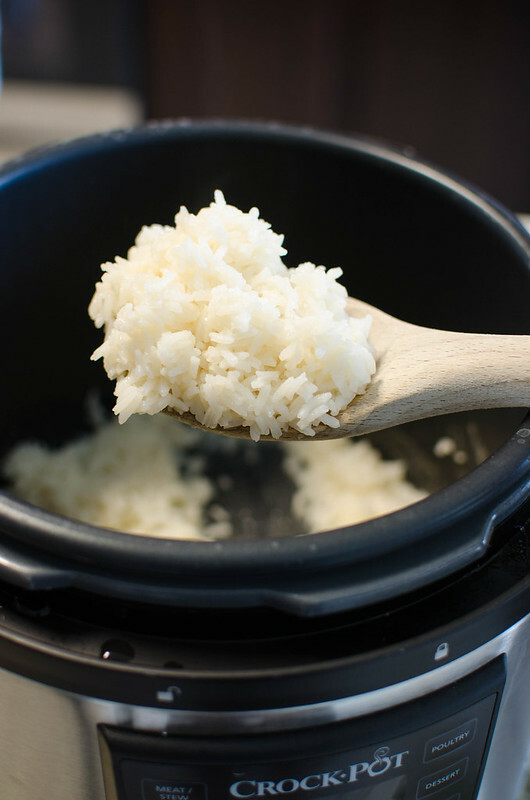 But the Crock-Pot Express Crock Multi-Cooker makes perfect, fluffy, not sticky rice in 12 minutes. It’s just one cup of white rice (rinse it well in a mesh strainer) with 1 1/2 cups water or broth. Then you just hit the “Rice” button. Anyway, the chicken is delicious and one of the only things all my kids agree on. 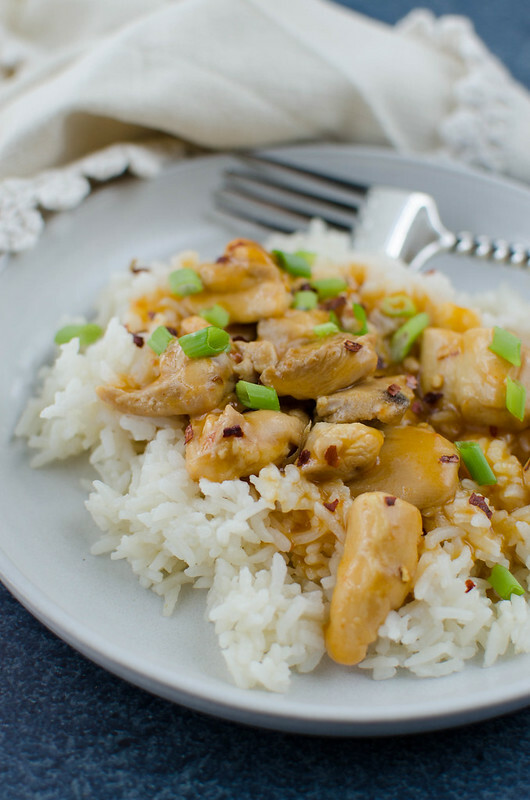 It’s sweet and spicy and the sauce tastes a lot like that takeout orange chicken that we all know and love. Place chicken thighs in Crock-Pot Express Crock Multi-Cooker. In a small bowl, whisk together orange juice, soy sauce, ketchup, brown sugar, sriracha, salt, and pepper. Pour over the chicken. Place top on the Express Crock Multi-Cooker; make sure it is locked and that steam valve is closed. Press the "Poultry" button and then the "Start/Stop" button. When timer goes off, press the "Start/Stop" button again. Do a quick release by using a long utensil to flip the steam valve to open. In a small bowl, whisk together cornstarch and water. Stir this into the chicken mixture; cook just a minute or two, until the sauce has thickened. Serve over rice with green onions and crushed red pepper flakes on top, if desired.